One of the greatest things about cats is their fondness of unusual things… just like their tails. Cat owners definitely have seen this… cats playing with their tails like it is the very first that they’ve seen it is just one of the bizarre things that they are fond of. 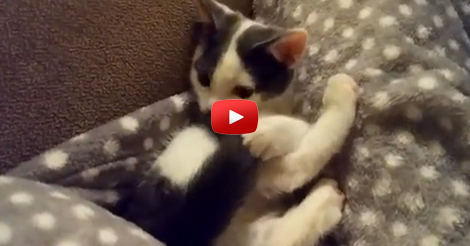 Just look at this kitty trying his best to catch his moving tail is just epic. He tried catching it like it is going somewhere where in fact it is part of his body. He seems to be mesmerize with his own tail which is very funny! Anyone who owns a cat knows about it… it is just their nature to be addicted with the most unlikely things. COMMENT and share your cats unusual behavior.